It was an ugly home weekend for Lincoln as the NTDP U-18 team swept the Stars and outscored them 19-3 in the two games at the IceBox. 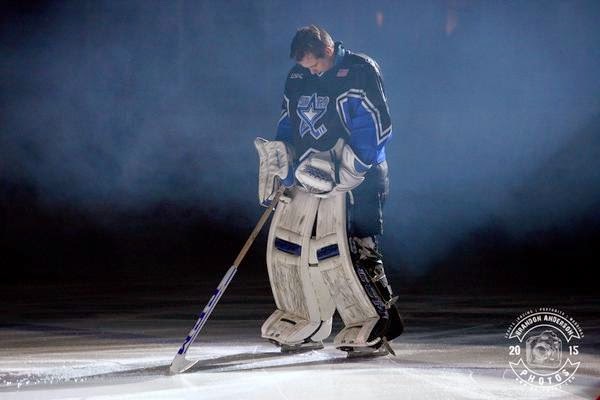 The Lincoln Stars are still in last place in the USHL western conference with a record of 16-32-5 (37 points). I attended the Friday night game, but I was unable to attend Saturday's contest. If you attended the game on Saturday, I'd appreciate if you would leave a comment below and let me know how the team looked. It was a dubious record the Stars didn't want to see broken but it happened anyway as the U-18's scored the most goals against Lincoln in one game in franchise history with a 11-3 drubbing Friday night at the IceBox. The previous record for goals against at home was 8 goals, which last occurred during the 2009-10 season. There wasn't much doubt that the U-18's were going to win this one after the puck was dropped. They put on a clinic. Most of the first period was played in Lincoln's end, and the U-18's outshot the Stars 15-5 and outscored them 2-0 in the opening twenty minutes. The U-18's scored the first five goals of this game before Lincoln got on the scoreboard. With only 1:42 remaining in the second period, Biagio Lerario scored his team-leading 17th goal of the season. Lerario's goal gave the home fans something to cheer about heading into the second intermission. In the third period, the U-18's scored first before the Stars went on a mini two-goal run. Down 6-1, the Stars scored two goals in less than a minute just before the halfway point of the third period. Ludvig Hoff's powerplay goal at the 8:53 mark started the mini run, and Chris Gambardella's even-strength goal at the 9:46 mark pulled the Stars to within three goals. Unfortunately for the Stars and the home fans, it quickly went south after that. The U-18's went on a five-goal unanswered streak for the remainder of the third period to finish out the scoring at 11-3. Stars goaltender Cam Hackett stopped 27 of 38 shots on goal in the loss. U-18 goaltender Jake Oettinger, who normally plays on the U-17 team, didn't see much action as he stopped 14 of 17 shots on goal to get the win. Team USA went 1-for-4 on the powerplay while the Stars went 1-for-3. I mentioned this on Twitter this past Friday night, but I also want to mention it here. I was really disappointed in how the coaches left Cam Hackett in net for this entire game. I really thought at the end of the 2nd period, or maybe after the first goal or two scored in the third period, Cam should have been pulled. That's not an indictment at all on Cam's play. It was a shooting gallery out there for Team USA. Cam wasn't getting any help at all. You could tell that Hackett was getting pretty upset in the third period as the Team USA goals piled up. I don't blame him at all. I guess I don't understand the philosophy of keeping your goaltender in there to get shelled like that. I doubt it helped his self esteem. Why keep him in there for all 11 goals? I'm just an idiot with a blog, but I would have liked to see it handled differently by the coaches. I, along with any Stars fans on Twitter, were very disappointed with how that went down. For the second time this season, the Stars were shutout at home as the U-18's skated to a 8-0 blowout victory on Saturday evening. I don't have much to post about this game since I wasn't there. Based on the boxscore, and the amount of goals against, it appears that the Stars may have played better in this game compared to Friday night. The Stars actually outshot the U-18's 23-22 in the final two periods, but unfortunately there were outscored 6-0 in those forty minutes. Peyton Jones got the start for Lincoln and stopped 28 of 36 in the loss. U-18 goaltender Luke Opilka stopped all 32 shots he faced to record the shutout. The U-18's definitely won the special teams war in this particular game as Team USA went 3-for-4 on the powerplay while the Stars were 0-for-6. The Stars wore special jerseys designed by trainer Corey Courtney in this game, and those jerseys were auctioned off afterwards with the proceeds going to the American Cancer society. They Stars haven't posted the individual jersey totals, but the grand total raised was $20,850. Lincoln, NE native Ethan Price's jersey was the priciest jersey auctioned off, going for $3500. In the past six seasons, the Lincoln Stars have raised a total of $224,125 for the American Cancer Society with their annual end of the season jersey auction. That's an incredible number. The Stars have just about raised a quarter of a million dollars for the ACS in just the past six years. Amazing. I'll post the totals from the past six seasons below. I think most fans knew that these two games against the U-18's were really going to be tough for the Stars. In my opinion, if these two games were played back in October or November, the scores wouldn't have been so bad. The Stars were playing better hockey back then, and the NTDP hadn't really had much time to gel. Playing the U-18's this late in the season is a killer. By now, the U-18's have played against a ton of USHL, college, and international teams and are very seasoned. Unfortunately, the Stars have seemed to regress as this season went along, and the U-18's are on top of their game. That's not a good combination. The two scores from this past weekend are evident of that. Team USA U-18's best player, forward Auston Matthews, finished with 6 points (3g, 3a) and was +6 in the two games against Lincoln. He is definitely for real. A lot of hockey scouts think he could be the #1 overal pick in the 2016 NHL Entry Draft. The Stars will go on the road this upcoming weekend with two games in Green Bay, WI against the Gamblers. These two games will likely determine which team finishes last in the USHL overall standings. Currently, the Stars have 37 points with 7 games remaining, while the Gamblers have 39 points with 7 games remaining. More on that series later this week. Okay so was Team USA the highly skilled, puck control team that Hull been saying we were going to see in Lincoln this year? Because they dominated the Stars like no other this weekend. I get that it was team USA and they have the pick of the litter when selecting players but this was by far the most embarrassing thing I've seen at the ice box in years. Then Hartsburg comes on the radio (atleast he showed up) and starting blaming the players once again on the loss, heres an idea how about Hartsburg and Hull get a mirror and take a good hard look into it and you will finally see what the issue is on why the Stars have struggled this year because its not the players, its the dumb and dumber show thats running things. Speaking of dumb, come on stars why are you trying to fix something thats not broken? The auction last night was a total cluster F&^#% and thats putting it nicely. 1st of all the Stars cheeped out and brought in some new auctioneers that had no clue how to run things. The audio was a complete joke. They missed bids, Ethans jersey would of gone for more if they would of looked around to see if there were anymore bids. Hell they even had to reopen a bid as the jersey was being paid for because the idiots running the auction had no clue what was going on it was a total joke no wonder they couldn't even come close to matching last years numbers. Thank god there is only a few more games left of the season then we can put this total train wreck behind us and rebuild once again because Im sure most of the players that are eligible to return don't want to because of the management staff that we have. I was at both games this weekend and while I expected us to lose both games, I somehow didn't envision it would get quite so ugly. I thought the Stars showed plenty of hustle in both games but we truly were up against a far superior team. I was also one of many fans who voiced displeasure that coach left Hackett in for all 11 goals--that really baffled me--heck, I thought he should have pulled Jones in the second game after 6 or 7 goals--there's no point to leaving a goalie in that long when things are going that badly. Really felt bad for Cam. Alot of fans are voicing there displeasure with management and the way things have gone this year. I'm trying hard not to fan the flames, because I really do have mixed feelings at this point. The logical side of me knows that "Rome wasn't built in a day" but the emotional side is infuriated by the way coach seems to throw players under the bus--during "coaches comment" after the first game, coach was asked about the 11-3 score and said something like "yeah, thats what happens when players just stand around..."
I'm just a fan, but what MY untrained eyes see is our boys busting their butts trying to make plays. It'd be nice if coach would SPECIFY what he thinks the problem is and then SPECIFY whats he's doing about it rather than making it sound like we have lazy players. I hope management is able to turn this program around and get us back on track for next year but given our lack of improvement, my confidence in Jon Hull and coach is SEVERELY SHAKEN! Yeti, I thought the boys played a little better Saturday, but the U18's were just too good. I was amazed at their passing. Tape to tape. No unwasted energy. It was impressive to watch. I didn't stick around for the jersey auction on Saturday. I heard from some friends who were that that it was a mess. Big learning curve apparently with this new staff. Hopefully next season is better. That photo by Brandon is interesting considering what happened this weekend. I'd hate to be a goaltender on this team. They get no help whatsoever by the defensemen in front of them. Pretty frustrating weekend to be a Stars fan, that's for sure. Also pretty frustrating to read in the paper our coach say something about how he was happy with our play last night and how we responded from Friday night. I really have no idea how a coach can say that after an 8-0 loss. It's interesting to read the comments from the (supposed) long time season ticket holders here and on the Stars Facebook page who are planning to drop their tickets for next year. The attendance is already dropping pretty heavily and in my opinion some changes are going to need to be made if they want to draw even 3,000 a night. It's not just about season ticket holders or selling tickets; if people leave early, they're losing out on a ton of concessions as well. The organization has had to have noticed a change in revenue over the past couple years. As others have said, it's the USHL and this is a developmental league... teams rebuild every year, it's not uncommon to have a new coach once every couple years or so, and it's not uncommon to have a lot of new players, so those are not valid excuses for this point in the year and I'm tired of hearing them. I've read a couple comments on here and on the Stars Facebook page that I was rather intrigued by, as they kind of echoed my feelings on the current situation with the organization. Some of the problems that we are seeing go beyond just the win-loss record. With the Pinnacle Bank Arena open now, and a number of other things to do in Lincoln, the Stars need to figure out a way to get people to come out to games. A lot of that has to do with winning games, but also making the Ice Box a place that people want to go to. In the 10 years or so that I've been going to games, a lot of the stuff is exactly the same as when I started going. I can appreciate tradition, and I know it's an old hockey barn (which I like), so there's only so much you can do. I was glad to see the new owner put a fresh coat of paint on, new lighting, and do a few other things, but there's still a lot to be desired. Switch up the intros, switch up the light show and music, add an instant replay board... all of these things could be done for not a lot of money. The intermission entertainment lacks a lot of creativity... they do the slingshot almost every game. Sort of on the same topic, since the new ownership, they've had a lot of staff turnover for whatever reason and with this has come some new issues. I don't buy a lot of concessions from the games, but I've still heard a number of complaints about long lines since they started accepting plastic. I went into Faceoff sports a few games ago and it seemed they didn't have hardly any merchandise I was interested in. They used to have a ton of different styles... I'm not sure why they no longer do. It sounds like they took a cheaper route last night with the auction and had different auctioneers. I've seen the zambonis break down a couple times on the ice and need to be pushed off. Of course, all of these things could have happened before. I am just saying I was really excited going into this year to have a new owner and new management and I can't say I'm all that impressed. None of these things even have anything to do with the losing season. Anyway, this comment is probably almost as long as your blog entry, Yeti, so I will stop here. I am not an expert at all, I am just a fan. The reason I comment is because I care about the team and organization; I am not abandoning them and I am not meaning to "bash" on my own team. I support the Stars 100%, and I totally get that these are young kids who don't get paid and are trying to get a scholarship. My comments are not directed toward them, I am directing them more to the management side of things. Its so obvious Hackett was left in there out of spite. No coach does that. Ever. I have coached hockey for years. Have never hung my goalie like that. I have seen hartsburg have a short leash with his goalies several times this season. Eleven goals is not a short leash. I don't know what the problem was but that was spite. This coach is in way over his head. The verbal lashings as players come off the ice on changes proves it. If he is failing to get through to players, that's as much on him as the players. If I were Cal, I would want a fresh start somewhere else. He is one of the few elite players we have. This coach, and Hull, need to polish up their act at the minor hockey level. The photo Yeti chose to use is pretty limited as he docent have access to my full game galleries, So this is one of the only photos I posted on a public forum IE Twitter or Facebook. Is it bad that half way through the 3rd of Friday night's game my wife and I were starting to cheer for Team USA to get more goals, we almost had both of our daughters ages up. USA came one short. I love the Stars. Flat out. I remember Fohr as a player, not an assistant for Team USA. I remember watching this small terp fly all around the ice, later to be our all time point leader. I remember Steve Ross, Mark Pivitz, Derek Reynolds, Nick Fouts all being assistants. The latter two after they're glory days in the black and blue sweaters. My second game I ever went to was a Sunday game against Team USA. I brought my buddy that had no clue what hockey was. But when Fouts lit up their d-man into the glass of section G, leaving a face print the remainder of the game, he was hooked. I've grown up with the franchise. Started going to games at 17. Now 33, it saddens me almost. I remember silly string, 200 consecutive sellouts, Danny Irman scoring a overtone goal against Omaha and the place erupting so loud no one could hear Craig announce the goal scorer or who assisted. I remember being there for Game 5 when the Vulcans beat us 7-2, to advance to the final before moving to kearney. Needless to say. I've been through it all with the Stars. The Cups, the non playoff years, the calls for coaches heads, and watching 2 am bag skates. I was there when we hung 13 on Cedar Rapids. Even that night Carlson yanked his starter. He didn't do was coach did Friday or Saturday. For Cam and Jones, I kept waiting for them to be sarcastic like Patrick Roy was on his last game for Montreal. Why he left then in is beyond me. It was embarrassing to the kids. I know they weren't getting much help, but enough is enough. I don't know if the owner's read this or not. I will always support these kids. They leave home unpaid chasing a dream at a young age. But how can I support a coach that does this to his players? Someone else compared him to Bo. They were right. The message is lost with this team. Either you change the teacher, or lose your class one at a time. Anyone remember Rochester players doing that in the final year of the Mustangs? Things need changed, now. We have a shrinking fan base. The performance isn't helping. We need new vision for the team, for the of ice entertainment, for what can be doing to get butts in the seats. More marketing, more TV, more radio, hell a billboard or three. Yes these cost money, but you have to spend some to make some. I started going to games and it was 11 and 12 a game. People have less disposable income now. Tickets have to stop rising. Keep them where they are our lower them slightly. Yes you lose 1 or 2 a ticket. How much do you make up on more butts? More food sold? I'm sorry. I love this team. But walking in this weekend felt like a Sioux City home game. Now the place other teams crumble when we cheer. Well, the dead horse has been beaten so hard it's just a stain on the old State Fair parking lot. When asked about the tradition of physical play in contrast to the puck possession style, our GM said on Twitter: "why can't we have both?" The problem is we've had neither. This team will face more shots than 2009-10 and take fewer than that same team - BY FAR (look it up on USHL's site). I don't have stats but do you think this team is physical? Nope. According to Elite Prospects, while this team is youngest in the league, it is also 7th tallest and 3rd heaviest. So a physical game isn't out of their ability. And we're essentially a season into it, age isn't the issue anymore. Especially when this team is only on average 3 months younger than SC and CR. This team has no identity and it's obvious when coach calls out the kids on the radio for playing a skill game against an elite skill team. Funny, but I thought Lincoln was a "skill" team. Calling out players early shows a little fire, an unwillingness to sugarcoat. In March? It means failure to communicate and get buy-in. In October, it's the players' fault. In March it's the coach's. Though USA games haven't been the biggest of draws this weekend looked like a pair of bad Tuesday night games. I still don't understand why the 3 year deal. Is year one just a throwaway year? Well, someone charged me full price for a throwaway season. And if so - umm, this is that "young team" so the same kids with bad habits are coming back, right? If this is a rebuild year, there hasn't even been a foundation laid. And before someone asks me, "you think you can do better?" Well, no. I'll just say this: I don't have to be Gordon Ramsay to know my meal stinks. That's why a chef cooks it for me. It's a stupid argument. Seeing a team give up 40(! )+ shots multiple times and many times being held under 20 says there's a problem. Seeing a flat-footed team get defended by collapsing to the net and picked off on powerplays is a problem. Hey, I hope I have to eat crow next year. I hope I'm wrong and all these words can be shoved back at me. I really do. I'll eat humble pie - with relish. The dwindling crowds and season ticket holders asking why they drive in to dim, rutted parking lots, see no specials and the same old intros, music and intermission events coupled with bad hockey are a problem. A poster talked about other options to get their hockey fix, people around me have said similar things: for the price of a season ticket they can get Center Ice, go to a Mavs game in a new arena in an entertainment district, make trips to NHL games (including a Stadium game in MN). And if we just have to have live hockey, then we'll grab a ticket. There's plenty of seats available. Great points. I would just add about the age thing...the roster on Elite Prospects that it bases our age off of includes: August Von Ungern-Sternberg (97), Ethen Frank (98) and Luke Jaycox (97). August isn't even on the team and hasn't been for months, Frank played 1 game with us, and Jaycox has played 8. You've also got Angus Scott (97) on there, who is a scratch half the time. My point is, take away those young guys who have hardly played here at all and gained very little USHL experience so far, and you'll find we are right in the pack age-wise. Somedays I watch this and can't help think of Major League. Tank and send the team somewhere else.